RALEIGH, N.C. — Falling Off the Sky is the first new dB’s album in a quarter-century. 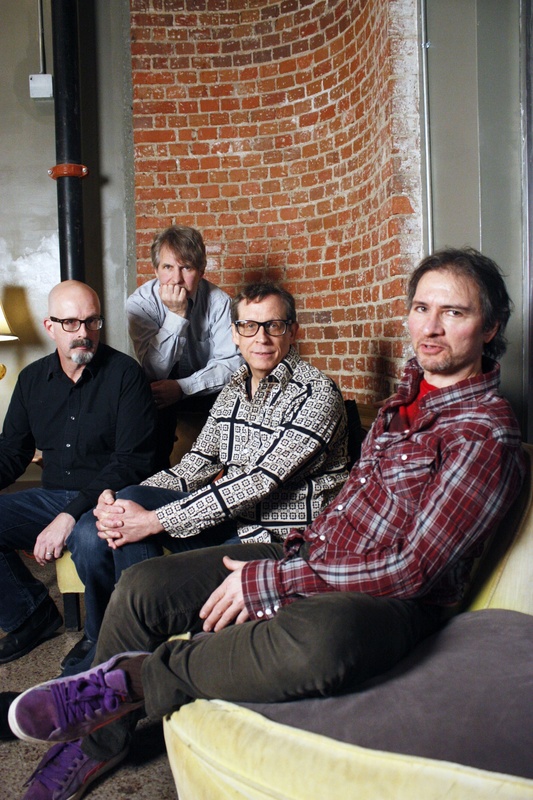 It’s also the first in three decades to feature the band’s original lineup of singer/songwriter/guitarists Peter Holsapple and Chris Stamey, bassist Gene Holder and drummer Will Rigby — the same lineup that recorded the beloved early-’80s classics Stands for deciBels and Repercussion. Street date is set for June 12, 2012 on Bar/None Records. The new album — produced by the band, with additional production by longtime cohorts Mitch Easter and Scott Litt — finds the seminal quartet reenergized and inspired, delivering a dozen new original songs that rank with the group’s finest and most influential music. The resurgent quartet’s renewed sense of purpose is apparent from the first note of the hard-crunching opener “That Time Is Gone,” and drives such indelible new tunes as the liltingly romantic “Before We Were Born,” the bluntly catchy “World to Cry,” the jangly, bittersweet “Send Me Something Real” and the insistently tuneful “Write Back.” Written and sung by drummer Rigby, “Write Back” is the first of his compositions to appear on a dB’s album. In addition to showcasing the band’s formidable songwriting skills, Falling Off the Sky finds the dB’s resuming the potent collective rapport that they began honing during their years growing up in Winston-Salem, North Carolina. 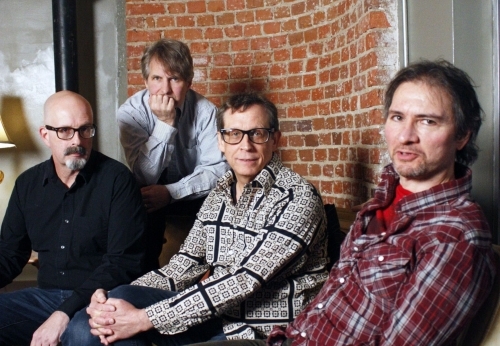 The future members of the dB’s began playing together, in various combinations, in their teens, in such early combos as Little Diesel, Rittenhouse Square and the now-legendary Sneakers, which issued a pair of homespun EPs that were among the first American indie-rock releases to gain national attention. In 1977, Stamey moved to New York, where he became Alex Chilton’s bassist and launched a short-lived yet history-making indie label, Car Records, which released solo singles by Stamey, Holsapple and by Chilton’s former Big Star partner Chris Bell. The dB’s formed in the summer of 1978, when Holder and Rigby moved north to join Stamey; the group debuted with the Car single “I Thought (You Wanted to Know)”/”If and When.” Holsapple came on board that October; although he initially joined as keyboardist, it wasn’t long before the band’s original repertoire was divided evenly between Stamey and Holsapple compositions. They soon emerged as local heroes in their adopted hometown, becoming the unofficial house band for the downtown music weekly New York Rocker, whose founder, the late Alan Betrock, became a mentor, releasing the dB’s single “Black and White”/”Soul Kiss” on his Shake label in late 1979. The dB’s signed with the British label Albion and released 1981’s Stands for deciBels and 1982’s Repercussion, which became instant favorites among the fans, critics and college-radio programmers fortunate enough to hear them. But the fact that the albums were available only as high-priced, sparsely distributed imports kept the band from reaching a wide audience in those pre-Internet days. Although Stamey exited in 1982, the dB’s released two more underexposed yet much-loved albums, 1984’s Like This and 1987’s The Sound of Music, before disbanding. Stamey launched a prolific solo career, while building a far-ranging resume as producer for such acts as Alejandro Escovedo, Le Tigre and Whiskeytown. Holsapple also recorded as a solo artist, cut three acclaimed albums as a member of the New Orleans-based supergroup the Continental Drifters, and moonlighted as sideman with R.E.M. and Hootie and the Blowfish. Stamey and Holsapple also briefly reunited in 1991 for the well-received duo album Mavericks. Meanwhile, Holder unveiled his guitar skills as a member of the Wygals and served a stint as bassist with Yo La Tengo, while keeping busy as producer and engineer on projects by the likes of Yo La Tengo, Luna and Steve Wynn. Rigby demonstrated his vocal and songwriting skills on a pair of solo albums, while serving as stage and studio drummer with Steve Earle, Laura Cantrell and Matthew Sweet. After reconvening in 2005 for a series of rapturously received reunion shows, the dB’s decided to cut an album of new material. Rather than impose an artificial deadline, they allowed the project to unfold at its own pace, convening periodically for sessions at Stamey’s Chapel Hill studio Modern Recording. Along the way, Holsapple and Stamey recorded another widely acclaimed duo album, hERE aND nOW, which Bar/None released in 2009. In addition to some distinctive guitar work from lifelong pal and former Let’s Active leader Mitch Easter (who previously played with Holsapple and Stamey in the teen outfit Rittenhouse Square, and with Stamey and Rigby in Sneakers) Falling Off the Sky includes contributions from an assortment of young players and singers from the current North Carolina alt-rock community, as well as string, brass and woodwind players from local orchestras. “We’ve all been through so much over the years,” Holsapple notes, “and our lives outside of the band are quite different from the way they were back then. But the way that we play together, and the way we relate to each other musically, is still the same. Not having to deal with the trappings of fame and success has kept us honest. Maybe we’ll never end up being household initials, but we’ve also never made a bad record. Our reputation is unsullied, and you can’t buy that.